Typically: When you are 18 years old you want to rearrange the world to suit your vision of utopia. Thirty or forty years later you are content to rearrange the furniture so you don’t fall over the table on your way to the toilet. Does this hypothesis hold in climate science? Does the task of saving the world from immanent climate related catastrophe have an inverse relationship to age? 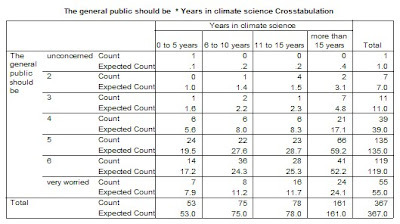 Using the data of the 2008 survey of climate scientists I explore the relationship between age (using a proxy measure - years worked in climate science - but we are well accustomed to proxy measures) and hyperbole. (Hyperbel). 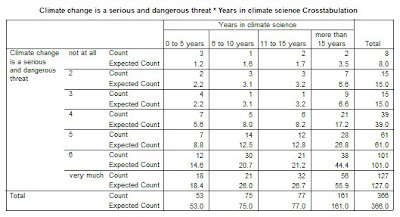 The possible response categories for years in climate science were 1 = 0 to 5 years; 2 = 6 to 10 years; 3 = 11 to 15 years; 4 = greater than 15 years. 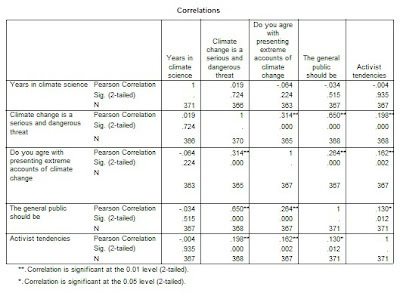 So what is the relationship between age and the perception of threat of climate change? How convinced are you that climate change poses a very serious and dangerous threat to society? 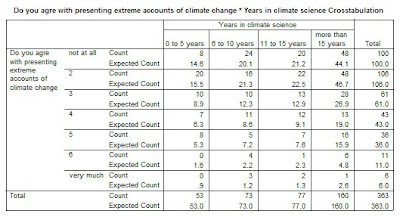 First of all we need to note that the sample has a considerable number of scientists that have been working in the science for more than 15 years, and of those who have been working in the science for more than 15 years a considerable majority tend to think that climate change poses a serious threat. What about those who don’t mind attempting to scar the hell out of Joe/Jane Public. Here we see that older scientists are not overly prone to Halloween tactics. In fact, the vast majority do not agree with presenting extreme accounts of climate change’s catastrophic impacts and there are no surprises comparing expected and actual values. The final measure has to do with what, not how, the public should be told, that is, should they be told to be unconcerned or very worried? Again, no surprises here between expected and actual values. And again, it looks like the public should be told to be worried. So what’s happening here? 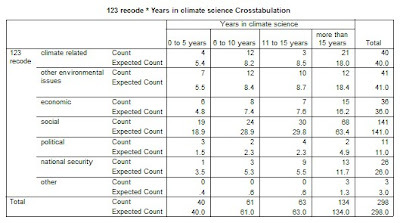 Has the entire scientific community been duped by the IPCC consensus? Are the current claims against the IPCC report mere blasphemy? What do you think is the most pressing issue facing humanity? 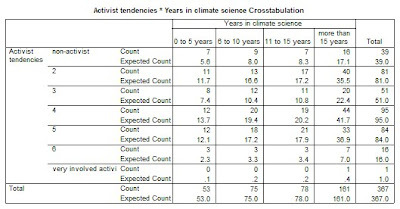 Although social issues rank a much higher level of concern than climate related issues (in 2008) we should note that climate change being listed as the main issue falls to that groups of scientists who have been have been practicing climate science for more than 15 years. If you were to rate yourself in terms of being an environmental activist, where would you place yourself on the following scale? After all that, if vested interest, towing the line and political correctness do play a significant role in determining scientists’ perceptions of their wares, it would be interesting to see the results of a new survey given the current climate of things climate. Is there a new ship leaving the harbour? Might some climate scientists have changed some perceptions of their science in the last few months? For what reasons? Any interest ina Name The Ship contest? I can't process the insights with the info tabulated that way. Could you give a correlation coefficient or something simple to show how much the two variables correlate? Much better. * I don't mean to be overly fussy. I just want you to get responses to the work that you've done. The more that you can explain things very clearly, simply, the better. Almost everyone surfing the net, reading a science paper, or a policy paper or business proposal wants to QUICKLY understand the key issue and insight. THEN after that to see how the result was derived, see caveats, etc. *Still far from perfect: most importantly this table should go at the front of your explanations. Then...clean out the duplicative parts of the matrix, clean out the x=x diagonal, lable significance as a percent (better) or at least be clear that it is a p-value...I had to read the asterisks before I realized that low values were "good", show more of the global question (paraphrase it if needed for consiceness, but I can't even tell what it means now...and even in text wasn't clear...forcing me to go back to the survey itself). "scar the hell out of" probably should start with "scare", as a scar generally doesn't come out.